Tuesday’s gain was a struggle, but the bulls can at least claim victory. It was an ugly, ugly win though. There was more bearish volume than bullish volume, and more decliners than advancers. And, none of the leading stocks were the usual (and critical) suspects. Market darling Apple (NASDAQ:AAPL) ended the day in the red, and the big winners weren’t overly familiar names. Stitch Fix (NASDAQ:SFIX) was one of the bigger winners, up 6%, but that’s not a name the average investor would recognize. The rhetoric was worry-oriented; a bunch of the market’s most prolific commentators are ringing alarm bells. Not every name is inextricably linked to the broad market though, whether or not it’s going to implode or keep on truckin’. 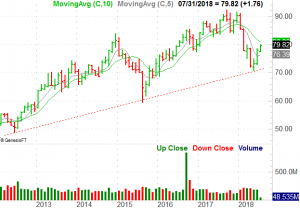 Tops among trading prospects at the midpoint of the trading week are Procter & Gamble (NYSE:PG), ENSCO (NYSE:ESV) and Walt Disney (NYSE:DIS). One’s bullish, one’s bearish and one could go either way. Procter & Gamble is “supposed to” be a mess right now. Waning sales, activist investors, a relatively new CEO and years of misguided management have been a key part of the headlines surrounding the company for years now. The fact of the matter is, though, the bigger trend has been bullish. Investors willing to buy on the severe dips have been handsomely rewarded. We’re just now coming out of such a dip. Click to Enlarge • The reversal evident on the monthly chart took shape at an established support line, legitimizing the bounce currently underway. There’s lots of room to continue recovering its way back to, and above, $90 though. 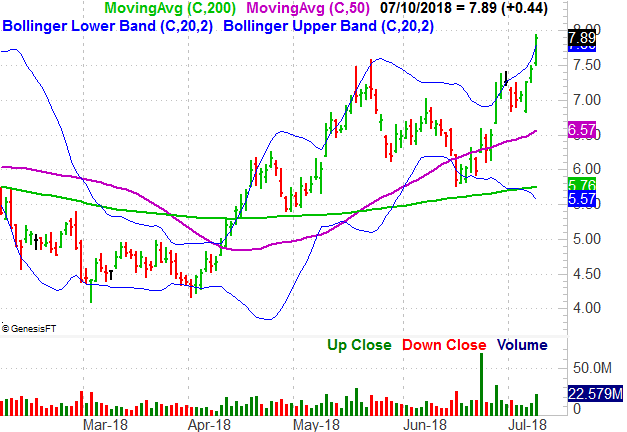 • Not that one good day makes or breaks a trend, but to the extent it matters, Tuesday’s high-volume gain from PG shares on a day all other stocks were struggling is impressive. 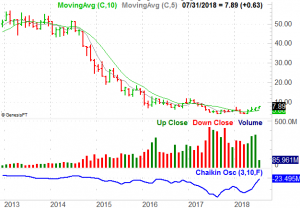 • There’s been a solid amount of bullish volume behind the well-founded turnaround effort that’s taken shape since May. Though oil prices have been moving higher for nearly two years now, not all stocks in the business have been moving higher for as long, or as well. ENSCO has been no exception to that norm. That relative slow start out of the gate, however, means there’s more room for ESV to catch up with its peers. It appears that’s starting to happen. 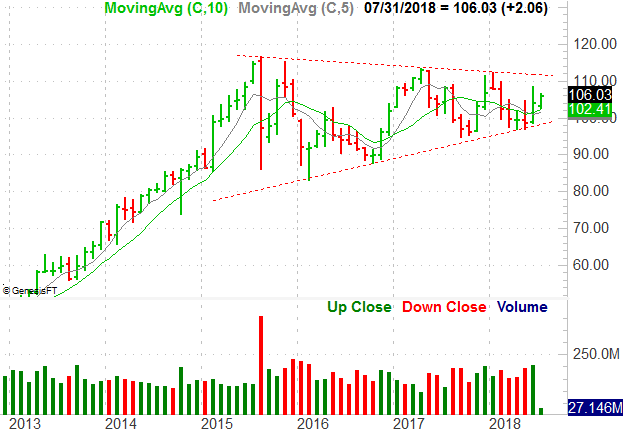 Click to Enlarge • Rather than a V-shaped reversal, which are prone to failure as they often lack follow-through, the monthly chart of ESV shows us a gradual, U-shaped turnaround that’s slowly gathering steam. That could last. • There’s plenty of volume, and growing volume, behind the current ascension effort. • The short-term daily chart is a bit overheated right now. 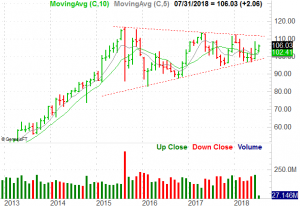 The smart-money move here may be to wait for a pullback and see where, or even if, the stock can regroup and rekindle the rally. The 50-day moving average line would be an ideal place for that to happen. Finally, Walt Disney shares are neither bullish nor bearish. Rather, they’re working their way closer to sizeable move, fueled by more than three years’ worth of increasingly narrow trading action. It’s likely that compelling progress with the purchase of Twenty-First Century Fox Inc (NASDAQ:FOXA), including the sale of its regional sports networks, will tip the scales one way or another. 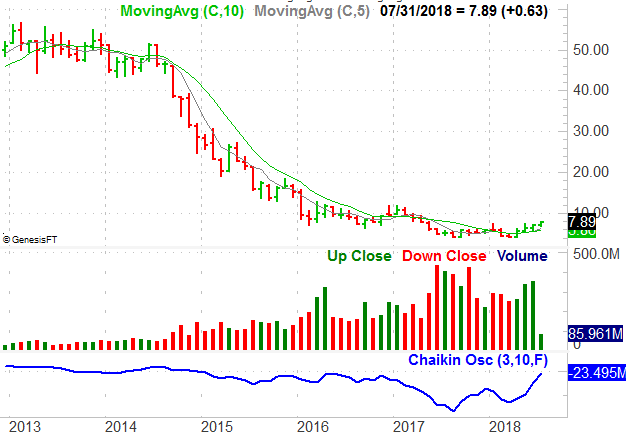 Click to Enlarge • The monthly chart shows a falling resistance line and a rising support line, framing the narrowing trading range DIS stock has been stuck in since 2015. 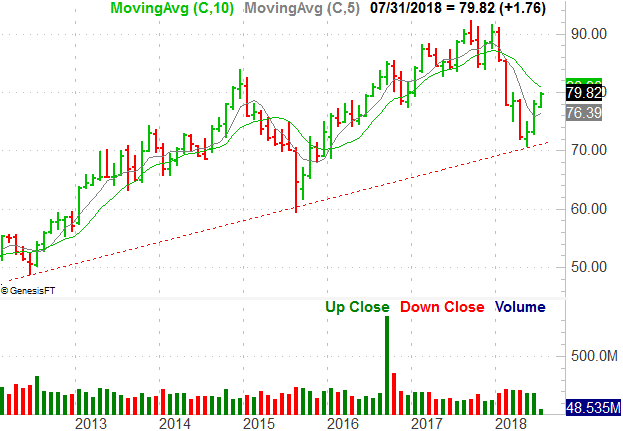 • Most recently, Disney shares have been in a bullish mode. 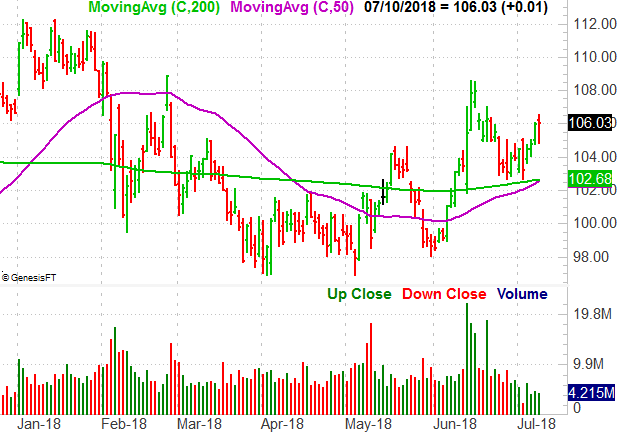 The 50-day moving average line is about to cross above the 200-day moving average line, both of which are sloped upward. At the very least this puts the stock in a scenario that could push it through the upper edge of the wedge pattern. • The upper boundary is right around $111. A move above that mark sets the stage for a sizable, prolonged advance. There’s three years of inaction to make up for. That works to the downside too. 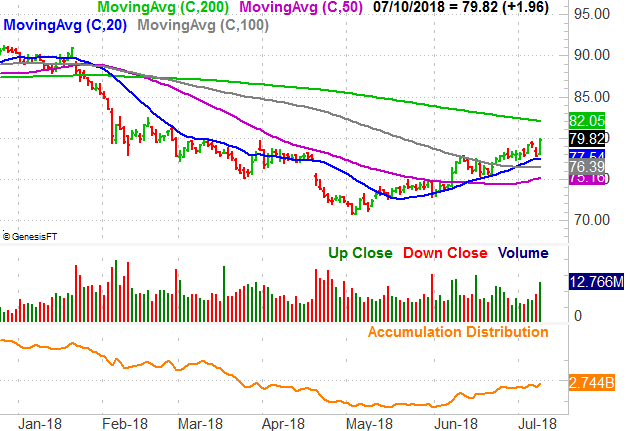 Article printed from InvestorPlace Media, https://investorplace.com/2018/07/3-big-stock-charts-for-wednesday-procter-gamble-ensco-and-walt-disney/.